← A multitude of mulberries! 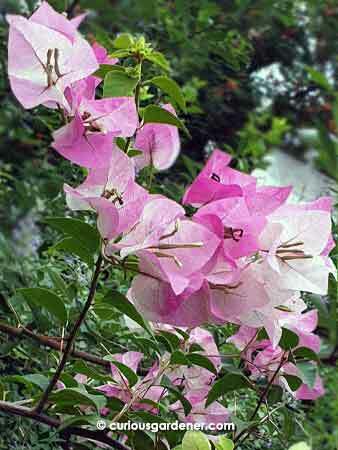 The heat is on, and our bougainvillea plants are loving it! Every other plant seems to be affected by the hot, dry weather – the lawn is turning brown in bigger and bigger patches, and flowering and fruiting plants are wilting by lunchtime. If we forget to water them for at least two days, there will be fatalities. 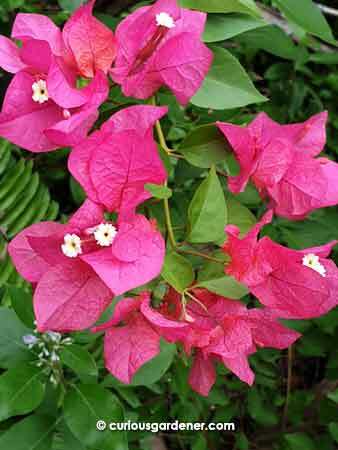 I normally despise our bougainvillea plants because I get scratched and poked by their thorny stems whenever I prune them. It doesn’t matter how thick the gloves are or how gingerly I handle the stems – the plants always get their revenge on me. However, the amount of colour that they provide in this weather is just gorgeous! My dad was the one who chose the plants. I have to admit that he had a good eye for this selection of colours! Besides the standard purply-pink, there are a couple of shades of orange, and the lovely bi-coloured pale pink and white variety. I have no idea what their names are; we just go by colour. I suspect a couple of them were given as cuttings. 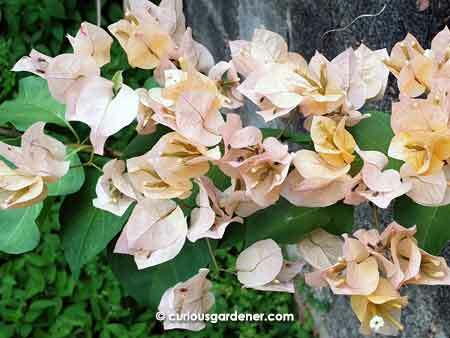 Pale peach bougainvillea flowers – not the most appealing colours to me, but certainly prolific when in bloom! 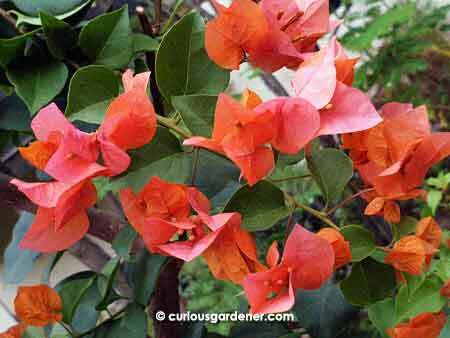 Dark orange, with a tinge of pink bougainvillea flowers – I quite like this colour!